Led by Richmond Schools Stand United, kids, parents, grandparents, and concerned community members rallied in Richmond on September 17, 2016, to protest school closures and the continued underfunding of public education. Jen Stewart of FACE spoke about provincial underfunding and Andrea Sinclair of the Parent Advocacy Network talked about the importance of advocacy. On the evening of Wednesday, August 31st, advocates, community members, and politicians gathered at Vancouver’s Douglas Elementary for the “Public Education Matters” forum organized by the Parent Advocacy Network (PAN) and hosted by the Douglas PAC. Erica Jaaf of Douglas PAC welcomes attendees. Andrea Sinclair of PAN next presented on advocacy: what it means and what it looks like. Advocacy means standing up for what you believe in. Andrea discussed how groups like PAN and FACE advocate in various ways for public education. She also explained the division of responsibilities within the education system. Jen Stewart of FACE and PAN joined Alex and Andrea on the panel for a question and answer session, which included many thoughtful questions from the audience. An informal networking and discussion session followed. FACE had an information table and a video booth set up (to collect videos for our next edition of “Can You Hear Us Now?”; more info on that soon!). Catherine Shaw (left) represents FACE at the information table. It was an informative and energizing way to prepare for the upcoming school year and all the advocacy that lies ahead. Many thanks to PAN for organizing and Douglas PAC for hosting. If you have a Facebook account, you can find PAN’s Facebook Live broadcast of the evening here. Richmond Schools Stand United is organizing a rally on Saturday September 17, at 4:30 pm, outside MLA John Yap’s office in Steveston. Find the details here. The BC Legislature’s Select Standing Committee on Government and Finance will be holding public consultations around the province in September and October in order to prepare its recommendations for Budget 2017. Please register (beginning Sept. 6) to speak up for public education as a budget priority; alternatively, you can make a written, audio, or visual presentation and/or complete an online survey. Find information on registering, making submissions, and dates and locations here. On October 5th, The Tyee is hosting an evening called “The Future of Public Education: Beyond the Headlines.” Jen Stewart of FACE and PAN is one of the speakers. Find more information and buy your tickets here. Mark your calendar for August 31st, and don’t forget to register if you need childcare. 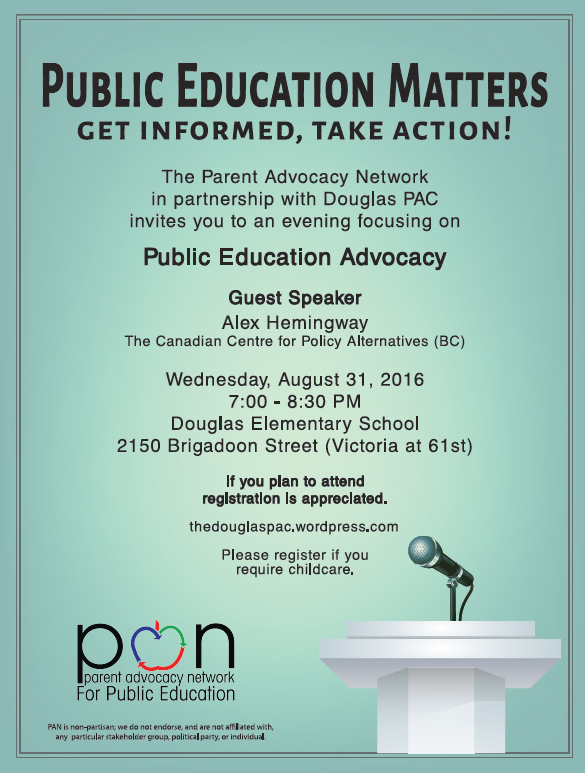 This is not just for parents—if you care about public education in BC, this evening is for you. You can find out more about guest speaker Alex Hemingway here. As part of its #RethinkPoverty campaign, the BC Poverty Reduction Coalition’s August focus is #RethinkEducation. Check out the website to see how education underfunding contributes to poverty issues in BC, and how prioritizing education will benefit all British Columbians. This Saturday, May 28, at 1 pm, there is a rally for public education at the Vancouver Art Gallery. This rally is being organized and led by students; let’s show up to support them! If you’re not in Vancouver or can’t make it to the rally on Saturday, you can always use our quick and easy email tool to give the minister of education and your MLA your input on public education funding.